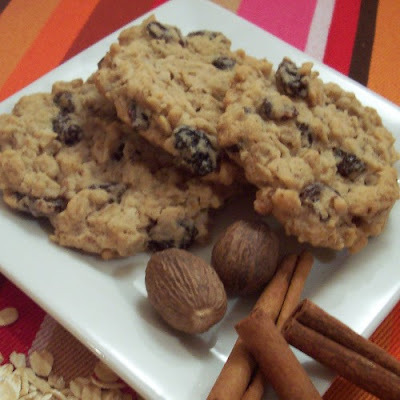 Although the latest version does require a little smoothing on the top to get that lovely flat cookie shape, using flaxseed meal as a binder produced tasty, chewy cookies indistinguishable from ones made with eggs. Preheat oven to 350°F. Line standard cookie sheets with parchment paper. Mix flaxseed meal with water and set aside. Sift dry ingredients together and set aside. Cream margarine with a mixer until fluffy. Add sugar and continue to mix until fluffy again. Slow mixer and add vanilla and flaxseed meal mixture. Slowly add dry ingredients until completely incorporated. Stir oats and raisins into the dough by hand until evenly distributed. Drop(!) by tablespoonfuls onto prepped cookie sheet about two inches apart. For thick cookies, leave dough as it is. For more traditional looking cookies, gently smooth the top. (They will spread somewhat, so they do not need to be completely shaped.) Bake for ten to twelve minutes, until edges just begin to brown. Allow to cool in place at least five minutes. If you move the individual cookies sooner, they will crumble! After five minutes, slide a cooling rack under the parchment paper and lift from cookie sheet. Allow to cool most of the way to room temperature while still on the parchment before picking up and consuming chewy goodness! This sounds great! And it was interesting to learn that cookies are one of the more difficult things to bake without eggs. I enjoy visiting your blog--it is interesting to read your recipes and posts, and learn about cooking for multiple food allergies. It is useful to get a different perspective than my usual peanut allergy perspective. The flax seed meal is a binder to substitute for egg. I wouldn't try to make the cookies without it. You can find it at most health food and some grocery stores. I've only bought one bag of it, and kept it in a zipper bag in my fridge for the last six months without it becoming rancid. Good luck, and let me know how the cookies turn out! Thanks for this awesome recipe. I am always looking for recipes without eggs, and just baked batch of these. They have come perfect and am enjoying them with milk as I type.